Photo has been published twice. Once in the newspaper, and the second time in the March/April 1985 "The Gold Historian." Photo was attributed to the collection of Curly Sammons. A gentleman named Ted Macy passed on a little bit of info on the following locomotive first seen in this post. Owner: David Ryan Construction Co. 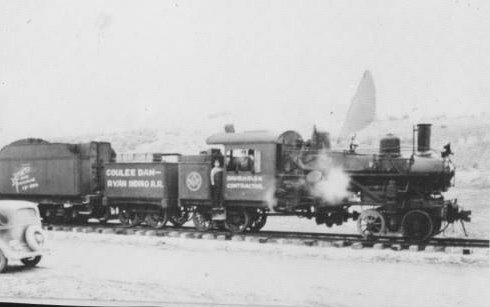 It would seem that this is the only known photo of the above locomotive. Sorry for the poor photo. They operated into the 1970s. From the "New York Times,"
This is the second part about the railroads that cross Grant County, written for the Grant County Centennial in February 2009. The first part can be seen here. The Great Northern (GN) built through what is now Grant County between July 19 and November 1, 1892 at a rate of about 3 miles per day. James J. Hill, who owned the St. Paul, Minneapolis & Manitoba (Manitoba), organized the GN to lease the Manitoba with all lines constructed or under construction for 999 years. 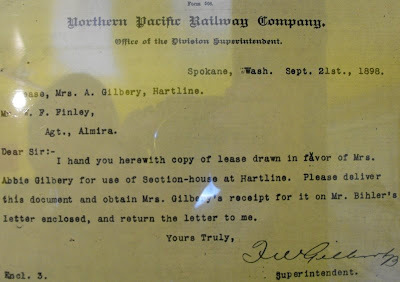 This lease started on February 1, 1890. The Manitoba completed the line across Washington State on January 5, 1893. Outright sale of the Manitoba to the GN happened on November 1, 1907. So in a very technical sense, the lines built through here were built by the Manitoba, though all paperwork associated with surveys likely said GN. But nits are being picked here. Early surveys had the GN crossing the state in different places than where it ended up. Consider that one survey had it crossing in the Coulee City area. Krupp, milepost 1569.5, was established in 1892. In 1905 an 8 x 12 tool house was used as a temporary depot south side of tracks. 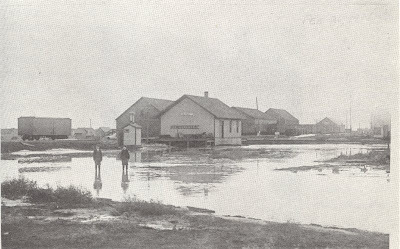 In 1906, a 30 x 48 depot was built. Krupp was renamed Marlin on 9-15-1918. The depot burned down on 5-18-1925. In 1926 a 24x48 depot from Downs was placed in the same location. In 1936 this depot was retired and sold and in 1937 a 16x24 bunkhouse was used as a shelter/shed type depot. This one was retired in 1984. Wilson Creek, milepost 1576.1, was established in 1892 and was an intermediate terminal from then to 1925, when the terminal was moved to Wenatchee. The depot was built in 1898 and was removed in 1975. When it was the terminal, there was a roundhouse and a large coaling dock. The dock burned down in the early 1920s, causing the GN great hardship. One account has the GN hauling coal from the Trinidad area to fuel its locomotives. Stratford, milepost 1583.9, was established in 1892. A 12x34 depot was placed there in 1912, it came from Berne up on Stevens Pass. No record shows of when the depot was removed. The first Adrian depot was at milepost 1591.5 in 1892. It was moved east to milepost 1589.2 in 1903. The depot was removed in 1938 and replaced by a small shelter. 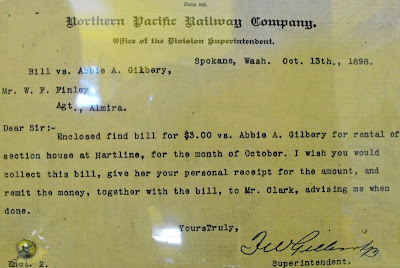 Adrian once boasted a turntable, probably used by the Northern Pacific to turn its train from Coulee City. NP's Washington Central built from Coulee Jct (now Odair) to a connection with GN at Adrian in 1902-1903. This was related to Hill's Northern Securities combination of NP and GN. Only in 1910, after Northern Securities was declared illegal, did NP build from Adrian to a connection with the NP mainline at Connell. This Adrian facility may date from 1903 for turning NP power then operating from Coulee City, some 20 to 25 miles away. There may have been little need for such a facility after the line was extended to Connell, so it may have been abandoned after 1910. During the building of Grand Coulee Dam, thousands of boxcars of cement were interchanged from the Great Northern to the Northern Pacific to be hauled north. Ephrata, milepost 1599.3, was established in 1892. Its depot in 1902 was a 24 x 48 building. In 1912, a 20 x 52 addition was built. 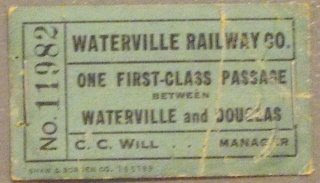 In 1944, the depot was 41 x 204. In 1980 it was shortened to 48 feet. Winchester, milepost 1609.3, was established in 1892. A depot was built in 1908, but was then reduced to a small shelter in 1945, but a new small depot was built in 1951. Quincy had its first depot at milepost 1617.9 back in 1892. It was moved to milepost 1615.5 in 1900. In 1906 a 30 x 48 depot was built. In 1959, the depot was extended and remodeled. It is still standing. Trinidad, milepost 1626.3 was established in 1892. It was named for a Colorado town of the same name, because of supposedly similar topography. A depot was built at milepost 1626.6 in 1900. In 1919, the depot was moved to milepost 1626.3. It burned down in 1931, and the depot from Rock Island was moved to replace it. Crater, milepost 1620.6, was established in 1900 when the line was relocated. It sat next to a crater made in the basalt when the same floodwaters that formed the Grand Coulee came through. It was discontinued in 1966. Sahara, milepost 1604.2, was established in 1908. It was renamed Orby on 10-25-1908, and then Naylor on 11-1-1908. Naylor was to have had an old boxcar for a depot at one time. One of the more significant wrecks was a train that jumped the tracks near Crater on August 26, 1917. The engineer died. Soap Lake, at milepost 1593.8, was actually in the Grant Orchards area, and as such was a few miles away from the town proper. 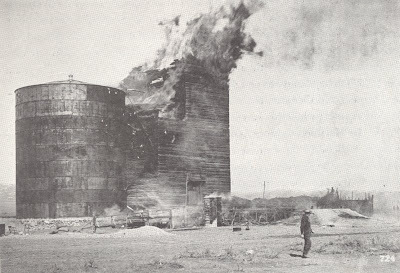 The depot was established in 1909 and burned down on 5-3-1945. It was replace by a 10x16 Watchman's House from Bridge 356 at Columbia River to be used as the replacement depot. Work to move the Watchman's house was completed October 1945.
curve and they either ran out of track or would hit cars already in the track, the dust cloud that followed was best described as mushroom, going maybe 7 or 8 stories in height. I often wondered if we ever put any workers in danger, but I never questioned the conductor.” The actual name changed from time to time. 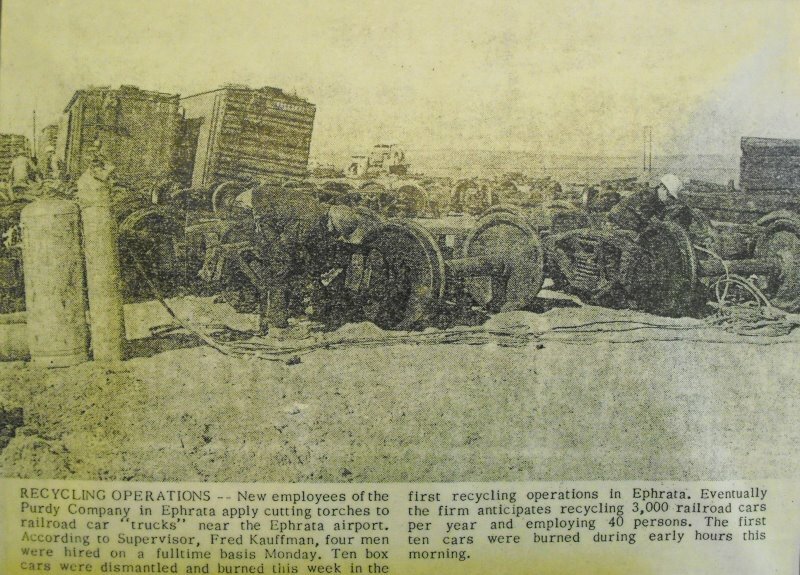 It was Ephrata Air Depot in 1943, then became Air Base, Washington in 1952, and last Air Base in 1974. Quincy seems to have had more than its fair share of trouble. There was a big derailment in 1952. A head on collision happened on November 6, 1963, causing much damage and claiming the lives of 2 trainmen. Another derailment happened March 8, 1979. A major derailment happened May 25, 1989, where a train going west hit a car on a crossing, then dragged that car into a switch in the track, which caused many cars to overturn. The only person who died was the driver of the car. There had been passenger service over the GN from near day 1. Notable trains have included the Oriental Limited, the Empire Builder, the Western Star, and the Cascadian. The Cascadian was a daytime train that ran between Spokane and Seattle. It quit in 1956. Passenger service continued until May 1, 1971, when Amtrak took over the passenger trains over the whole United States. 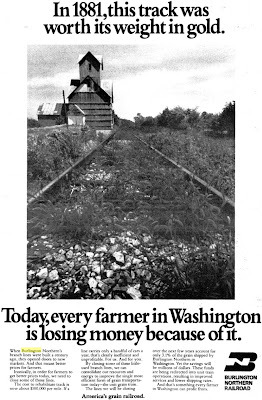 There were no passenger trains until the summer of 1973, when the North Coast Hiawatha was extended to Seattle via Wenatchee. A short-lived train was a daytime passenger service operated between Spokane and Seattle for Spokane's Expo 74. Budget cutbacks killed the North Coast Hiawatha in 1981. The Empire Builder returned to the former GN line in October 1981, when the BN, who was trying to close its line over Stampede Pass, asked that Amtrak reroute over the GN instead. Amtrak service has continued in some form since then. The GN was upgraded from time to time, with the most significant being the removal from use of the passing sidings through Ephrata and Quincy. One of the major complaints over the years before the overpass was built on the south end of town was the meeting of 3 trains in Ephrata. A local would be parked on the industry track, with another regular train on the siding, both waiting for a higher priority train on the mainline. This would tie up both crossings for motorists. The Great Northern became the Burlington Northern on March 2, 1970. As the GN was the main route the BN used to get to the west coast, the line became busier with the rerouting of a lot of traffic off the old Northern Pacific mainline over Stampede Pass. BN decided to use the GN route for higher priority intermodal freight. This saw the removal of most general freight trains to make room for trains carrying trailers and shipping containers from overseas. The main reason for this was the limited capacity of the 8 mile tunnel under Stevens Pass. 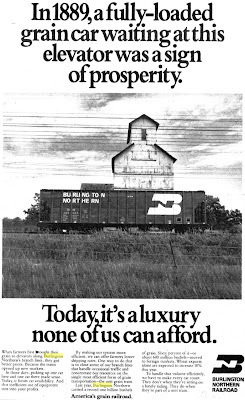 BN bought the Atchison Topeka & Santa Fe Railway and was renamed the Burlington Northern Santa Fe Railway (BNSF) in February 1995. It is still the main intermodal line to the greater Seattle/Tacoma area. Amtrak still runs its strongest long-distance train over this route, with its old Great Northern name, the Empire Builder. Special thanks to Dean Ogle and Bob Kelly for correcting errors. Fire happened on March 12, 1916. Sparks from a passing train started the fire. "Mike is dead. That is to say that Mike, who was a big, tough, ugly, good-natured bull-dog, got up against the wrong proposition the other day, in the shape of a train, and consequently Mike passed to happy dogdom in two parts, where in a ll probability he is now enjoying his eternal daily scraps with other dogs. "Mike, whose surname might be said to be Heywood-Richardson_Hale, launched forth into town life about a year ago and found it most congenial, as he had plenty of dogs to fight, his undescribable ugly features attracting attention, and his good nature winning many a hand pat. "Mike first came to town to act as guardian of the bank, where he resided nightly for some time. But eventually losing the job through negligence he became patrolman over the dog fraternity in town. Certain it was that Mike would rather fight than eat, unless it was to eat some other dog, and day after day Mike might be seen coming down street, grinning and happy, although covered with blood and numerous dog bites. "Unlike most bull-dogs, however, be had a very sensitive nature and hated to have any mean trick played on him. Such he never forgot or forgave, and of such was one when one day he was standing near the piston of a locomotive the engineer opened some valves and Mike got steam-heated. This was too much for his dogship and he promptly grabbed the cowcatcher, but the train refused to come his way. "Ever since that day Mike challenged the train, whenever he was around, until it was ended by Mike getting under a wheel, and as the wheel was not a dog, Mike got the worst of it. "If we had a depot that covered the distance that the freight and express does when thrown from the trains it would reach over 300 yards. Oranges, flour, sugar and other articles are scattered as if they were being sown in the wind." "The railroad workers were paid off at this place one day last week and spent one half of thee night bruising and the other half in patching up the bruises." "Quincy has no depot after two years, not even a shed to protect the waiting passengers. The only passenger service is at 12:44 AM and 3:44 AM and sometimes it is bitter cold waiting for a train that is late several hours. The business at the station will average $2,000 to $3,000 a month, and lots of business is kept away because we are on a blind siding, and yet the company will not consider a petition of our citizens for a depot." "Mr. Eaton, who was one of the first to locate in this country but had returned to his home in Virginia, made a trip here on business. When he arrived in Spokane he had no thought that he was only half way, timewise that is. Quincy is only 140 miles from Spokane, yet it took Mr. Eaton four days and nights to make the trip. The train he was on got as far as Odessa and on account of a washout had to return to Spokane and come around on the Central Washington line. The officials neglected to awaken Mr. Eaton from a nap at his destination and he rode through to Wenatchee. Catching a freight at Wenatchee he got as far as Trinidad, that being a pretty long run at one time for the GN, he had to leave the train there and arrived in Quincy on foot, much disgusted, but not more so than the usual traveler of the GN."